My new-found love of drafting collars continues with this dress. This time I made a shirt collar, after being delighted with the success of the shirt collar that I drafted from my pattern drafting class. The fabric is the last of the fabric that I bought when I was visiting my friend in England. It was £6 per metre, and I bought 2.5 metres. Here is what it says on the selvedge - "Nottinghill, Joel Dewberry for Freespirit Westminster Fibers Pristine Poppy". I didn't bother trying to match the print because I didn't think it was necessary, and it turns out I was right! To attach the collar, I used the method from my Granny's Simplicity sewing book, which is the same as Four Square Walls excellent tutorial. I have to admit that I got pretty fed up with this dress about half way through though. I had some problems fitting the skirt, which is the full skirt from McCall's 6696 - I finally caved and bought this pattern after seeing so many lovely versions. I forgot just how much ease there is in the Big Four patterns, and traced and cut my waist size - and it was huge! After a lot of pinning the pleats together on the pattern pieces, and eventually basting the whole dress together, I got it sorted out. Then there were the thirteen buttonholes. I knew the automatic buttonhole on my machine would throw a wobbly at that (as seems to be their way); but I sucked it up, put an episode of Miss Fisher on Netflix*, and got on with it. My machine was very kind, and made about nine buttonholes before giving up, which was enough to sew on some buttons and try it on. And I was delighted with it! Especially as I wasn't sure if I liked the fabric; but I think that's quite a common thing with me - I just get tired of looking at the same fabric when I'm working with it for so long. And while I'm talking about buttonholes, thank you to Emmie for the comment about horizontal versus vertical buttonholes in my last post. I again used horizontal buttonholes, and this time used 1cm buttons. This made a big different for the number of buttons that I could fit on the bodice. I also lengthened the bodice by an inch, and now the length is perfect. You can see in the below photo that my hand is on my natural waist, which is where the waist seam is too. Hurray! I didn't use the McCall's bodice, but instead drafted mine from my block, and didn't do the yoke and gathers at the back. I also made a fold-over placket, instead of a separate placket. I drafted this from the Craftsy Pattern Making Design: Collars And Closures class. I'm delighted with how my dress turned out, and even decided that it could be a replacement for this much-loved Anna dress with a gathered skirt, which had definately seen better days and has gone the way of the recycling bag. In other news, I am now off work for two weeks (hurray! 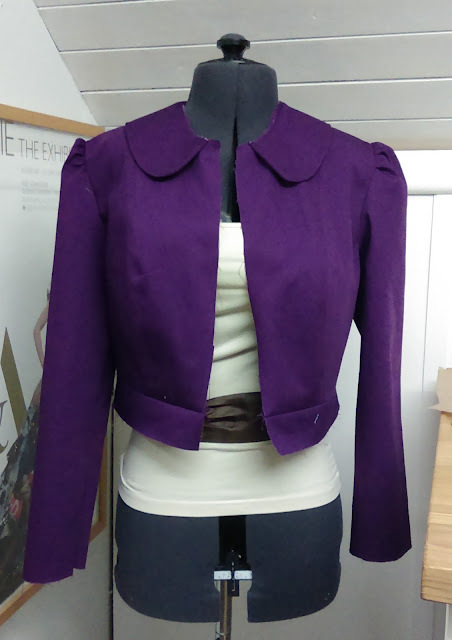 ), and have decided that the time has come to make a coat. I'm using the Deer and Doe Pavot pattern, which is a happy coincidence, as apparently pavot means poppy - I'm hoping that's a good sign! 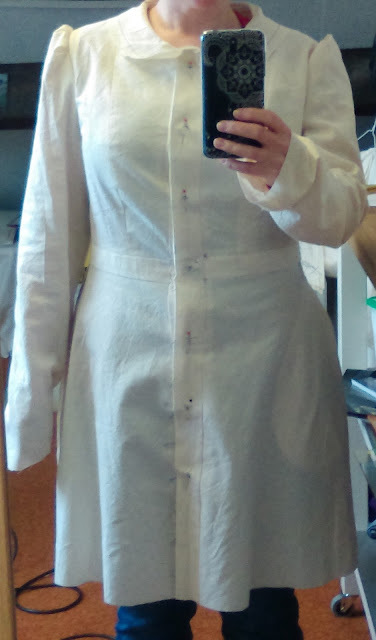 I've made a toile, and the only thing I had to alter was to shave a bit off the centre back seam and shorten the sleeves. Yey to a pattern company that fits me from the packet! But, me being me, I can't make the pattern as it is, and want to add a lining and welt pockets. Here's a not very good phone photo of my toile. I got it cut out yesterday, and here's how much I did last night. Due to a last minute change of plan re the lining fabric, I can't do any more until I get the new lining fabric that I ordered yesterday. But I will try and remember to put some progress photos on Instagram if you want to have a nosey. *Miss Fisher Murder Mysteries is my new favourite show, but sadly I have finished watching both series, and can't find out when series three is to show in the UK. And if I sound all modern with my Netflix business; I have to say that I didn't exactly know what it was until about a month ago! Thank you! I hadn't really looked at the pleats on the back until you mentioned them! I am in total awe of anyone who even considers sewing their own coat!!! Yours will be stunning in purple and I think you may need to knit yourself coordinating accessories for it! Love your dress fabric - I actually have a project bag in the pink version. It's got a lovely feel to it. Thank you! I'm doing this the other way around, because I think the coat will go with the purple and mustard shawl I finished earlier this year. Not a sewing-related comment (although i really like your dress and your blog, which I recently discovered), but also love Miss Fisher! I finished watching the second series a couple of days ago and I really want more! Isn't it just brilliant?! I can't wait for the third series to be shown in the UK. Your dress is gorgeous! Also, may I say I think your Pavot might look great if you just made a short jacket instead of a full-length coat? Thank you! I hadn't thought of a shorter length coat, and I agree that it would look great. I want a longer coat though to wear as a rain coat. A rain coat Is a useful thing in Belfast! Thank you! I love the fabric, and yey to another Miss Fisher fan! Thank you! I'm delighted with the fit. Lovely fabric. And yes - I have just discovered Netflix - or as we have come to know it - ‘Flexiknickers' Shocking, I know!! Lol!! Flexiknickers - that's brilliant!! Your dress looks great, what a lovely fit you have there! Also the fabric is perfect, that has to be my favorite colorway! Thank you! I'm really pleased with how my dress turned out. Another perfect dress! Love the colour of your coat - looking forward to seeing this one in completed. Another lovely dress! I love Miss Fisher too - Season 3 recently aired here in Australia, so hopefully you'll get it soon. Thank you! You lucky thing! Hopefully it will on in the UK soon. Thank you! I hope you love the Miss Fisher shows! Oh my gosh this dress!!! It's absolutely gorgeous!! !